From collegiate chemical engineering classes to a fast-paced factory floor, being a woman in STEM and manufacturing has shaped me as a person and professional, and also as a leader. I knew early on that a STEM degree could lead to a variety of jobs, from astronomy to healthcare to engineering. But I didn’t make the connection between a STEM education and a manufacturing career until I began my career at Mars over 25 years ago as a graduate trainee. Over the last 15 years, the number of jobs in the manufacturing industry has declined. However, recent data is encouraging: this month’s BLS report shows that the manufacturing industry has added an average of 14,000 jobs per month (from November 2016 through August of this year). As manufacturing remains the largest and most dynamic sector of the U.S. economy, it’s imperative to future-proof the industry. For every $1.00 spent in manufacturing, another $1.81 is added to our economy – a multiplier effect even higher than business. Manufacturing today is a dynamic, innovative sector. Given the impending manufacturing skills gap and hiring challenges many organizations are facing, and the significant economic consequences at stake, I would urge all STEM advocates and educators to promote manufacturing careers to today’s STEM students. Here why STEM can’t neglect manufacturing. STEM education promotes subjects related to science, technology, engineering and mathematics, from elementary school through college. In recent years, with the increasing cultural and commercial importance of social media, STEM has been closely linked to digital technologies. Of course, this makes sense; digital fluency is key to professional success, socializing and navigating the Internet of Things. However, the proliferation of programs which equate STEM education with technology and computer science gives short shrift to the rest of the acronym. Now more than ever, we need engineers, scientists and mathematicians to drive progress. For example, the U.S. needs engineers to help reshape our infrastructure. Scientists must continue developing cures for diseases from cancer to cholera, and according to the Bureau of Labor Statistics, the need for mathematicians in the labor market will increase 23% between today and 2022. And from my point of view as the head of a company that manufactures millions of products each day – we need more STEM students of today to become tomorrow’s manufacturing workforce. The “end of manufacturing,” represented by factory closures throughout the U.S., has been exaggerated. Today, manufacturing is the largest and most dynamic sector of the U.S. economy. Deloitte reports that each dollar spent in manufacturing adds $1.37 to the U.S. economy, and every 100 jobs in a manufacturing facility creates an additional 250 jobs in other sectors. Incredibly, if the U.S. manufacturing sector was its own country, it would have the ninth-largest economy in the world, with more than $2.1 trillion in value. Moreover, manufacturing isn’t just about factory lines and widgets – it’s about changing how we do business. According to the Bureau of Economic Analysis, manufacturers in the U.S. perform more than 75% of all private-sector R&D nationwide, driving more innovation than any other sector. 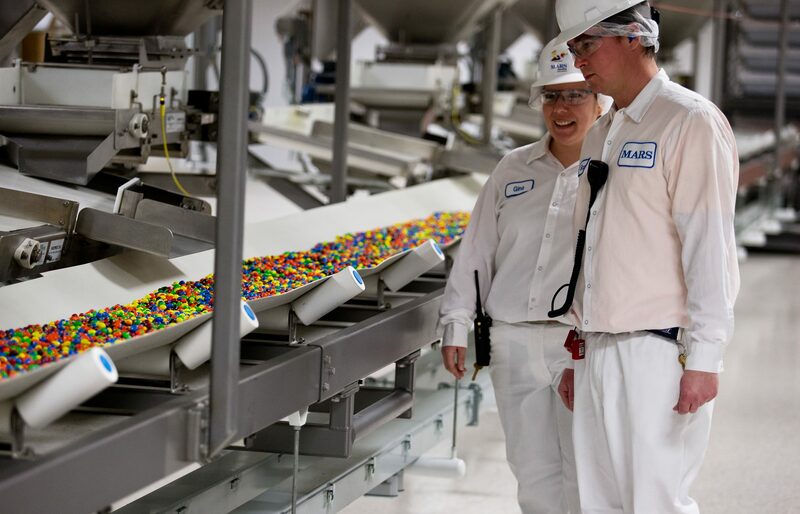 For example, to make M&M’s Caramel, Mars partnered with engineers and product development scientists to design new machines for our production line. We invested $100 million to build a new manufacturing site in Topeka, hiring 70+ Associates and boosting the regional economy. While Mars U.S. makes beloved products such as Skittles, Uncle Bens, M&M’S, Orbit, Pedigree and Snickers, we identify ourselves as a manufacturing company. In fact, in the U.S., Mars has hired over 1,040 new manufacturing Associates since January 2017, and there are currently approximately 462 manufacturing positions open. Our goal is to hire more than 1,500 new manufacturing Associates total by the end of this year. To achieve this ambitious goal, and recruit prospective Associates for manufacturing roles, we will leverage our STEM education partners nationwide. Currently, Mars has relationships with 22 technical schools, colleges, universities and even high schools across the U.S. These partnerships include everything from curriculum development to trainings to apprenticeships, and help to identify, recruit and develop top-tier manufacturing talent. Partnering with educational institutions is just one way to raise awareness of the STEM-manufacturing connection. But more must be done if we are to effect real change. I urge my fellow manufacturing companies across the U.S. to take a stand and speak out about the need for a stronger STEM-to-manufacturing pipeline. With more than 3.5 million manufacturing job vacancies estimated over the next decade, we must act now to raise awareness of manufacturing as a viable and vibrant career, inspiring the STEM students of today to take on manufacturing roles tomorrow. Tracey Massey is the President of the Americas for Mars Wrigley Confectionery, responsible for leading strategy, sales and operations in North and South America for the world’s largest manufacturer of chocolate, confections, gum and mints. With over 20 years of experience at Mars, Tracey oversees a multi-billion-dollar portfolio of iconic global brands that include M&M’S®, SNICKERS®, SKITTLES®, STARBURST®, ORBIT®, and ALTOIDS® in her current role.